Long-time KRVM listeners know how much the station loves the blues. 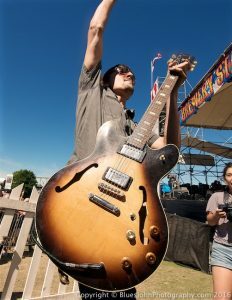 For blues aficionados, there was excitement in the air as guitar phenomenon Ty Curtis performed in Albany at the Northwest Art & Air Festival. KRVM: How long will you be performing that day? You can find Ty Curtis’s music on his website or on iTunes. Find additional tour dates here. Freelance writer and volunteer blogger Cynthia Orlando writes the Music Scene blog here on the KRVM website. An avid music fan and active blogger, Cynthia loves to discover new music and share it with her audiences. Learn more on her blog page. Allen Co. Design It! Build It!